Wow, what a crazy summer it's been! I am so sorry I just haven't had a lot of time to blog and/or craft lately, life has just been super busy right now. I am sure there are some of you guys out there that can relate, right? 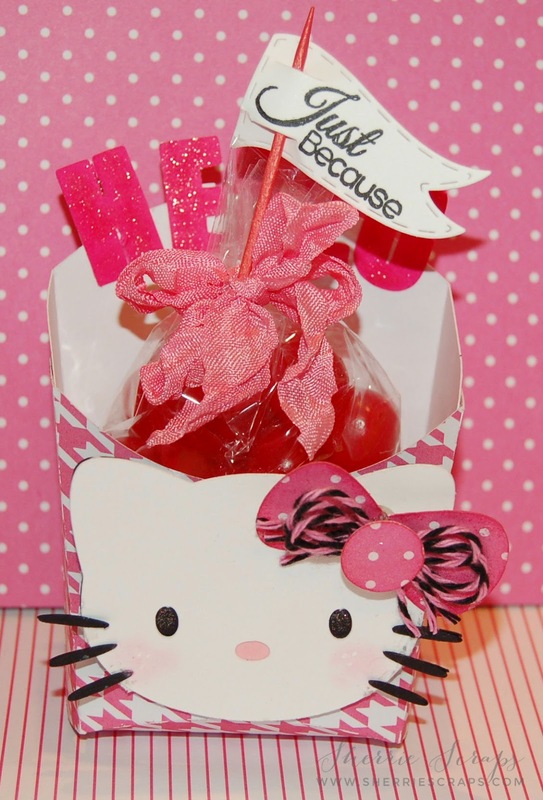 A few days back Jaded Blossom and SVG Cutting Files had their 2nd Annual Hello Kitty Blog Hop. They were giving away over 20 Hello Kitty SVG cutting files away free for completing the hop. Jaded Blossoms even has coordinating stamps to go with the files! Wow, how fun is that? I am hoping to make all these file eventually~they are all so stinken cute! I cut the fry box at the size the file came in as with papers from Recollections. I adhered it together with some amazing Tombow Extreme Adhesive tape that I won from The Cutting Cafe blog. Wow, this stuff sticks like crazy...perfect for boxes. I re-sized the Hello Kitty just a little to 1.949 along with the layers. I added some fun pink midnight Trendy Twine that I picked up a while ago and tucked a double bow under the center piece for a fun look. I added rosy cheeks and a few freckles to this cutie. The box was filled with some yummy red sour balls. Ofta, are they ever sour BUT perfect for little kiddo's, right? 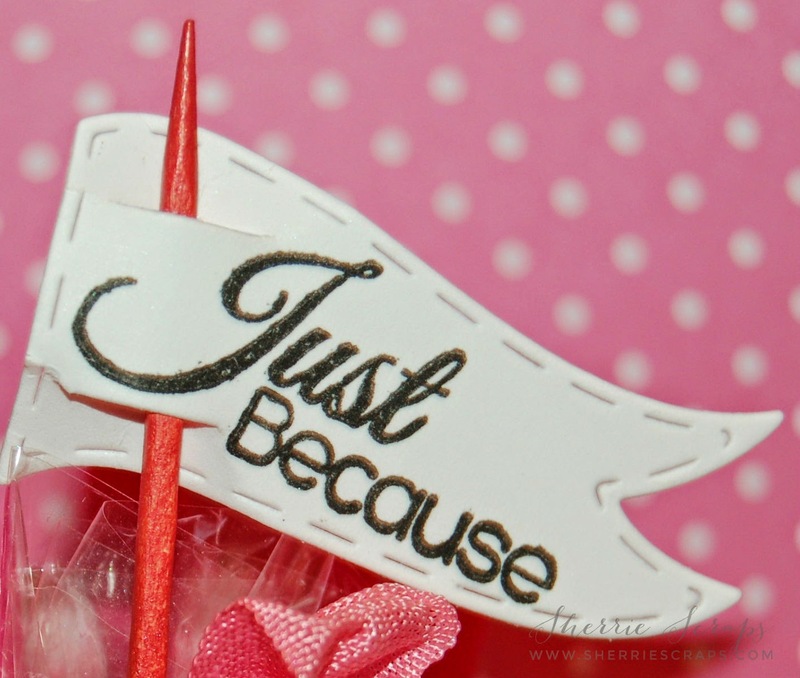 I tied on Princess Party Pink ribbon from Lovebug Creations and poked in a cute little banner. I used Jaded Blossoms Treat Flag Die and stamped the sentiment with Jaded Blossoms Simple Sayings stamp set. Oh so glad you reminded me Sherrie! I bet my stamps are sitting out in my mailbox, better go & check. Cute, cute, cute fry box. Oh Sherrie, this is so absolutely adorable!! HK is so sweet!! I love the sparkly letters and her adorable bow!! You always add the perfect touch to projects!! Love, love this!! Arya's friend will adore it!! What a great treat holder I love the HK with her sparkling letters I haven't had those candies in forever and now you not only have inspired me to do a Hello Kitty card I need to go buy some of those candies. Thank you for joining my DL.ART July linky party, Have a Blessed day, my friend ps I hope yu see some light at the end of the tunnel. DIANA L.
Really Cute! Thanks for joining the Jaded Blossom Summer challenge! This is just so adorable! Thanks for joining Jaded Blossom Summer Challenge. Super sweet Sherrie, love the Twine bow!! This is just PRECIOUS!!! Love HK!!! ADORE the pink midnight trendy twine!! WOW! this are very cute Sherrie and I love all the pink and that cute banner:) Thank you for joining us over at Decorate to Celebrate. Awwww....Sherrie! This is so super adorable! LOVE that sweet file and all your added touches to make this one AWESOME HK project!!! This is SO super cute Sherrie! Love the pink and white color combo and how you added the flag to the toothpick! Thanks for playing along at Jaded Blossom! Super cute, Sherrie. 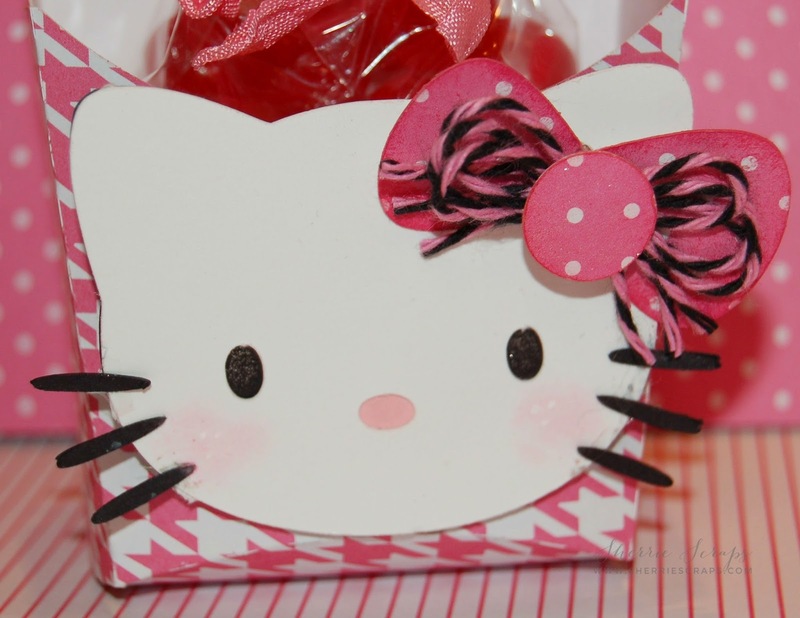 Great idea using the fry box and the Hello Kitty is adorable. Thank you for playing along with us at CardzTV!! Too sweet! Thanks for playing along at Jaded Blossom. Love this Sherrie! It's super cute! Sooooooo cute!! I love Hello Kitty!!!!! Very cute! Thanks for playing along in the challenge! Absolutely Adorable. Love HK. Thanks for joining our challenge over at Jaded Blossom this month. Absolutely cute!!!! Thanks so much for participating in our DECORATE TO CELEBRATE challenge!! Hope to see you again for our next challenge!! Sherrie ~ EEK! Your project is seriously ADORABLE!!! OMG ~ I mean who doesn't LOVE Hello Kitty!!! I can TOTALLY relate to your post ~ what another CRAZY summer! Extremely busy ~ hence the stalking I am behind on! UGH! Before we know it ~ it will be over! This is so cute, Sherrie!!! I LOVE the pink hounds-tooth paper you used for the box and your crinkle ribbon and twine bow look fabulous! Perfect details!!! Thanks for linking up over at Decorate To Celebrate and CardzTV!!! What a super cute treat box!! I love Hello Kitty!! Thanks for joining us at Cardz TV! 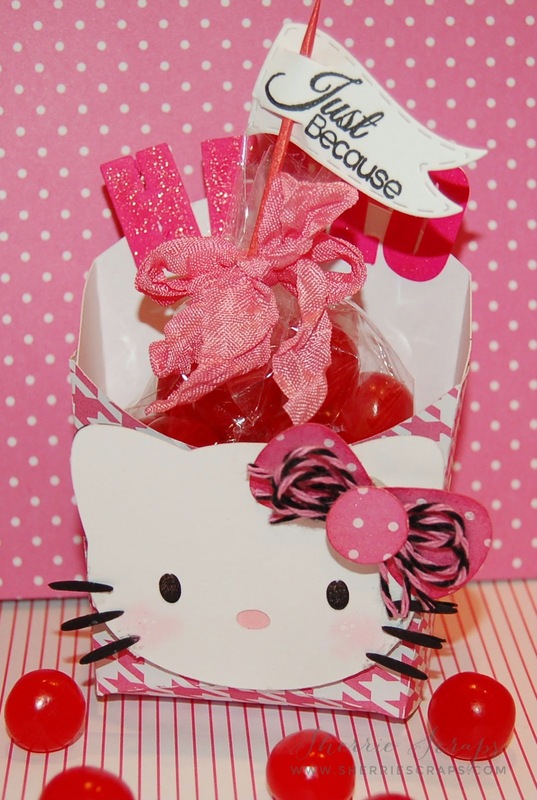 What a adorable Hello Kitty treat box. Love the paper. Have a creative day.